The All Blacks are preparing to be without seasoned campaigners Ma'a Nonu and Jerome Kaino for the second Bledisloe Cup rugby Test against Australia in Auckland. Inside-centre Nonu and blindside flanker Kaino came away from the 12-12 draw in Sydney with respective shoulder and elbow issues and underwent scans on Monday. Assistant coach Ian Foster says team management would have a better idea on Wednesday of the seriousness of the pair's injuries. But neither Nonu nor Kaino trained on Tuesday and Foster rates their chances of running out at Eden Park as "highly unlikely". "We put them in cotton wool," he said. "We will know more tomorrow, but the signs are looking that they won't play on Saturday." Ryan Crotty looks the front-runner to take over the No. 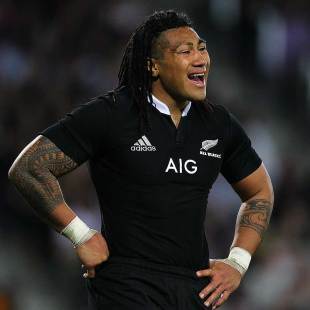 12 jersey if Nonu, whom he replaced midway through the second half at ANZ Stadium, is confirmed as ruled out. Another option is Malakai Fekitoa moving in from outside centre, but Foster said the three-Test rookie was seen as a longer-term prospect at second-five. He said Fekitoa provided cover for 12 off the bench and was looking more comfortable in the position the more time he spent there. "So we have to weigh that up versus the likes of Ryan coming in and carrying on what he did." At No.6, the All Blacks would appear to have a ready-made replacement for Kaino in Liam Messam, who was rested from the series-opener because of his heavy Super Rugby workload with the Chiefs. But Foster also said Steven Luatua, who was included in the reserves last weekend but did not get game time, was a possibility. He added that prop Charlie Faumuina had got over his illness and was available for selection this week. Meanwhile, experienced centre Conrad Smith is back in camp after missing the Sydney Test because of the birth of his first child. "He's just jumping out of his skin," Foster said. "He'll be ready to go."